Green Acres Ranch is more than a cozy place to stay...it is a work of art surprising its happy guests with beauty and creativity. 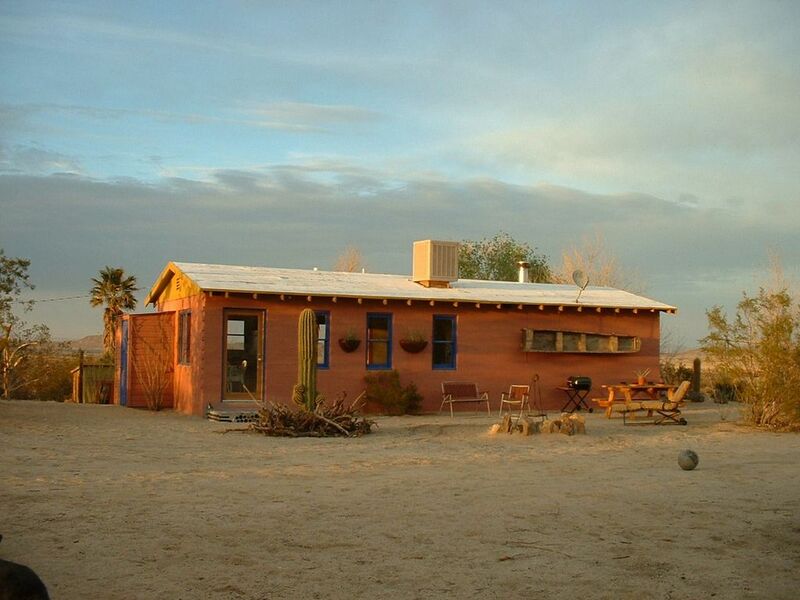 The ranch has two separate cabins (rented individually or together - see our other VRBO listing #506635) and is on acres of clean and sparse Mojave Desert land. Several lounging areas, hammocks, and fire pits help you soak up the sun, the stars, a good book or a glass of wine (It's rumored that a bottle has greeted a guest or two). For those who love wildlife, our mature trees and other plant life attract a host of twittering birds and scurrying critters: quail, doves, friendly bats, and roadrunners to name a few. Ravens often nest in the large Tamarisk trees at the front gate, raising new hatchlings each year. We're located less than a mile away from the boundary of Joshua Tree National Park, and our convenient location near the 62 Highway provides easy access to all nearby locations without sacrificing a sense of peaceful seclusion. Daily excursions may include Joshua Tree National Park (West entrance less than ten minutes away), East Mojave Scenic National Area, Big Morongo Wildlife Preserve, Palm Springs, the Coachella Valley, Big Bear Mountain, Twentynine Palms, Pioneer Town, or Giant Rock. We are Albert and Sandra, artists from the Los Angeles area. Joshua Tree is the best getaway from the city, if you want big open skies and uncrowded spaces! Green Acres Ranch has a relaxed and unpretentious feeling that guests instantly respond to. What our guests really enjoy about the property is that it provides great comfort, yet has the slight feel of 'roughing it'. We are private, and yet easily accessible to Highway 62.
toilet, shower, Outdoor shower is cold water only. Sorry, no tub. Towels, toilet tissue, soap, shampoo, conditioner, lotion and tooth paste provided. The southern side of the Joshua Tree Park Park mountains are viewable to the south. Evaporative 'swamp cooler'. The Roadrunner cabin has additional air conditioning in the sleeping area. Mini-split system in sleeping/living room space. Wood stove and portable electric heater as well. Firewood provided for indoor heating. It's the desert... parking everywhere! Good for basic web surfing (not fast enough for most movie-watching). Basic coffee maker. Also, a small french press is there for your pleasure. The small dining area adjoins the kitchen and reading area. Dish Network basics plus Encore Movie Channels. A few, and horse shoes. Walk up Sunkist Road and into the border of Joshua Tree National Park in less than 20 minutes. Wood provided for indoor burning stove (bring wood for outdoor fires). Stereo speakers also play outside. Gazebo is shaded, and has misters and lighting. Guests can use pool at Joshua Tree in (6 minute drive) for $15 per person per day after 3pm. Dog house behind cabin. The 2 1/2 acre area surrounding the cabins is fenced as a whole, but the cabins do not have individually fenced areas. Dogs must be people and dog-friendly. Only house-trained dogs are allowed indoors and not allowed on the furniture (bring doggy bed). This was our second time staying and we had a wonderful time. Thanks for everything! This place was an absolute delight as a place to stay and explore Joshua Tree National Park. It is indeed 'artistic, cool, and funky' as advertised. But the photos don't really do justice to the attention to detail in supplying everything you could want or need. Everywhere you turn around there's a touch that's not only cool and funky - but also functional. We would add the terms 'whimsical, fun, and creative' to the mix. If you like non-standard accommodations that retain the comfort and convenience of 'standard accommodations', this is your place. It was just plain fun! We highly recommend Fort Freaky. Well appointed, cozy, comfy, and clean. The caretaker CJ was so attentive and very welcoming. We absolutely loved the place and will stay again when we return to Joshua Tree. Awesome Location, Well Designed and Great Outdoor Space! This place is is in a great dog friendly location near the West entrance to Joshua Tree Park, close to restaurants, markets, convenience/gas stores and liquor stores. That said it is right off Highway 62, so you do hear traffic noise, BUT this place is so cool & hip and has everything you will need for a nice comfortable stay you may not even notice. Make sure you get up early and watch the sunrise! NOTE: Take Sunkist Road off Hwy 62 and down the dirt road to get to the place. We had a wonderful 3 day escape from the big city. The house is comfy and everything feels selected with heart and artistic eye. This was very inspiring. The house is small and perfect for 2 and has incredible light. Very bright and happy. The park is super close and we spent a lot of time on the rocks :) - We will be back. Thank you! The Cactus Flower does get some special light. Our rates are flat (no taxes are charged to you). We accept VRBO billing, Paypal or personal checks or eChecks from U.S. guests. We only accept VRBO billing, Paypal or cash from foreign guests.